So we checked out of the Inverness Premier Inn after a not-so-good night’s sleep and set off on the road for the North Coast 500. 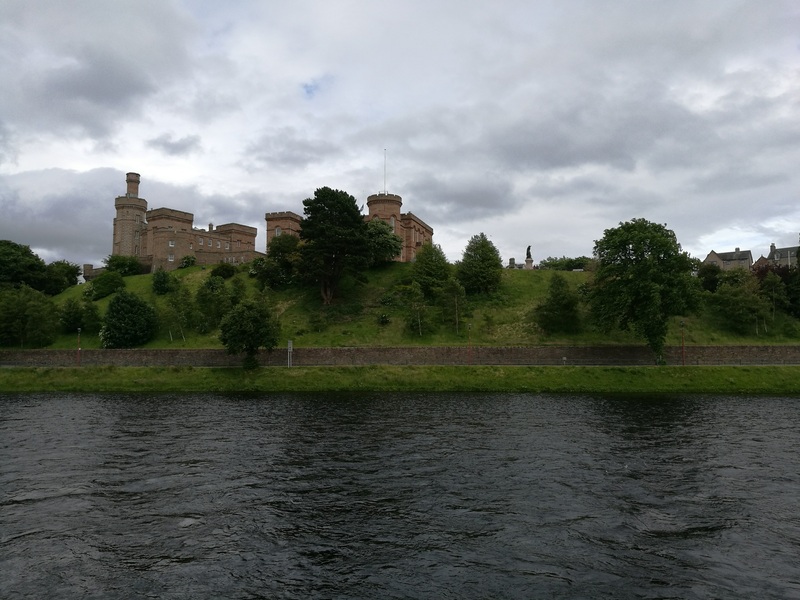 After a swelteringly hot Edinburgh on the Sunday, at Helena’s Wedding Party, we weren’t expecting the 14° temperature or the sullen grey skies and pouring rain! However we were doing a drive around the coast of Scotland and there were some serious miles to cover. Back in the car then, we set off again. It’s worth mentioning here I think, that what was a fast two-lane metalled road suddenly turned into a single lane track in the blink of an eye. Lunch was supposed to be in the popular Applecross Inn but as it was pretty much at capacity with fellow travellers, we ended up having chips upfront at The Applecross Inn Side Out. Heartily recommend the chips by the way though a word of advice ……if there are two of you, one portion is enough. So, today we check out of the lovely Torridon Inn, which is in such a beautiful setting nestled between two craggy mountains. It was lovely in almost every way, except perhaps for Mrs C’s porridge. ‘Cream and brown sugar’ said the breakfast menu. Semi skimmed milk and white granulated sugar brought the young Antipodean waitress. It was like a re-run of the time she ordered Spelt Porridge in Charlton House and was served the kind of workhouse gruel that Oliver used to complain about! It’s funny when you look at the map and see the A832 trunk road and it turns out to be narrower than our own front drive. It does authenticate the remoteness of this area though. The dramatic 3000+ feet Beinn Eighe towered over the road on our left until we found something we thought had Livingstonian heritage. 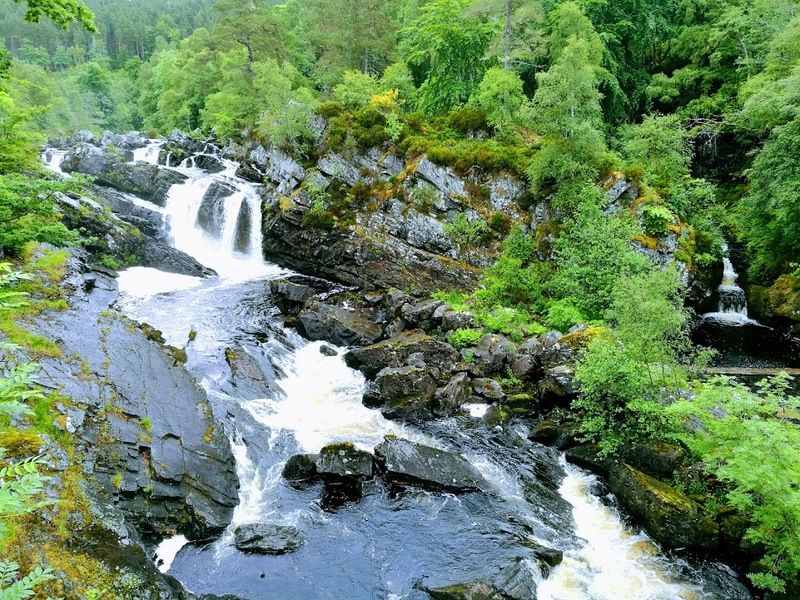 Expecting the magnificence of the Zambezi, it came as no surprise to find that ‘Victoria Falls’ was a small, but very pretty cascade, from which we had a fantastic view over Loch Maree and its wooded islets. Civilised loos are few and far between in this part of the country, so Mrs C has become an expert in the art of tootying down between two car doors to ease nature’s pressures. For a man it’s a different story as, in the words of the great Plato, ‘The world’s your urinal’ anyway. Sometimes not as convenient as it sounds when you’re trying to avoid European tourists who are often more omnipresent than the resident midges. 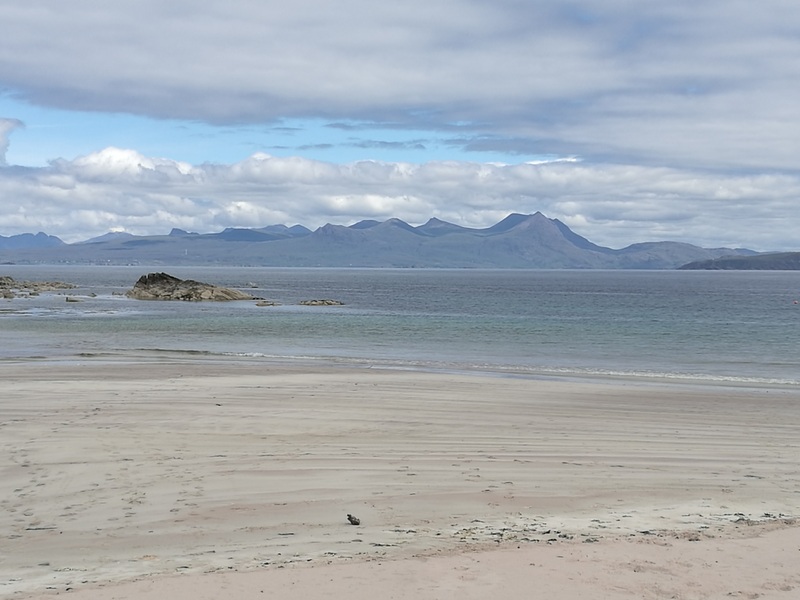 Next stop was Gairloch and a Flat White in the coffee shop overlooking the harbour, before moving onto Mellon Udrigle. The beach there wasn’t the warmest beach we’ve ever walked on but it was certainly one of the most beautiful. Ironically the rest of The UK was melting in the hottest heatwave for twenty years whilst we on The NC500 were barely hitting double figures! We came down alongside Little Loch Broom, through Dundonnell and the most stunning scenery, into Ullapool where our AirBnB was. Jackie, our host, was as friendly as it gets and we had a really good sleep. Knocken Crag was next on the agenda and what a cornucopia of all things geological that was. I reckon I learnt more about rocks and geology there than anywhere else in the previous 50 something years. Very interesting, very windy ….. buy why were the loos closed?! 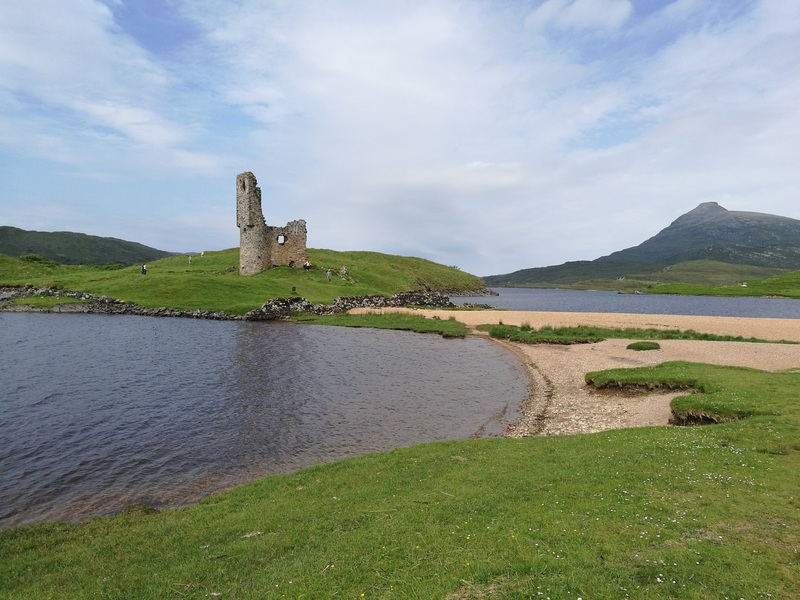 Ardvreck Castle, the scene of much bloodshed over the centuries and supposedly haunted, was a pleasant stop for a walk , situated in a mini promontory into the loch. Then came Lochinvar and The Pie Shop for lunch. Obviously we went for the pies – Venison and Cranberry for me and Steak and Ale for Mr. C. Thery tasted so good and it was well worth the pit-stop. 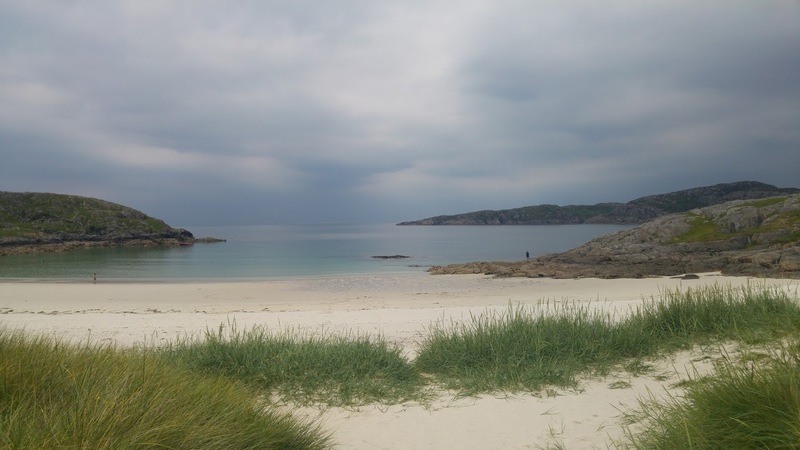 Achmelvich Beach with its white sand and turquoise sea was an unexpected bonus. So tranquil, so beautiful and a real highlight of the trip. Then came the Drumbeg Viewpoint where we saw a sign for the ‘Award-winning Drumbeg Stores – Best Villages Shop in Scotland’. We didn’t go in so I can’t confirm its authenticity! In Durness, we stayed in Aiden House and what a lovely house that was. Alexandra’s breakfast set us up for the day but meant we were too full to try the hot chocolate at Cocoa Mountain just down the road. Our daughter Helena, who did the North Coast 500 last year had sung the praises of this ‘amazing’ chocolate so much, that I was really looking forward to it. Still there’s always next time! 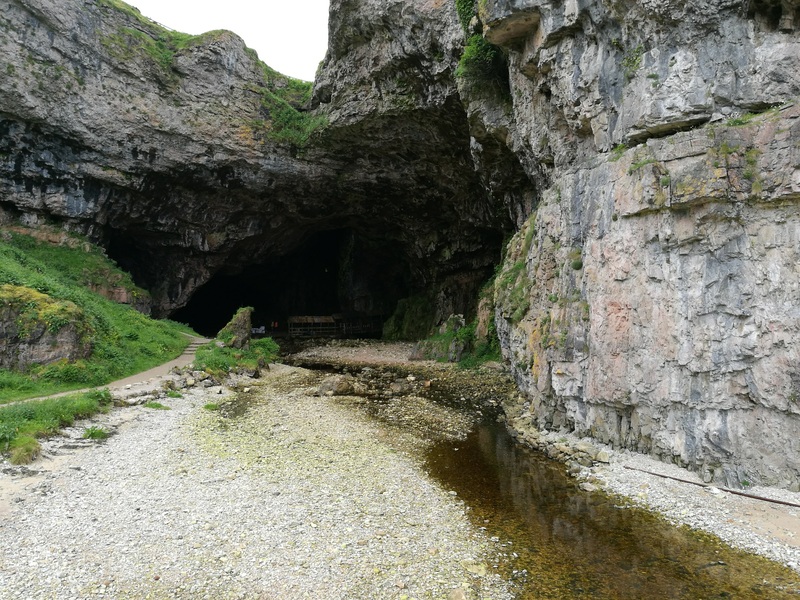 Smoo Cave is pretty much a must-see for anyone visiting this area and although it’s free, it’s well worth paying the extra for a mini boat tour a bit further in beyond the Waterfall Cave. The road to Thurso, our next overnighter, was considerably less picturesque than the previous few days. It’s all relative though, I suppose, as the scenery up until today had been so awe-inspiring, that anything would pale by comparison. Thurso, quite frankly, was a bit of a dump although the various tourist sites seemed to promote it as some kind of metropolis! Our room at the Inn at Y-Not was clean and contemporary and being right in the middle of town gave us a few choices food-wise. Eventually we plumped for the ‘eat in’ option in the pub downstairs. The food was OK, but the entertainment was priceless! Who knew you could have so much fun with a mobile phone! 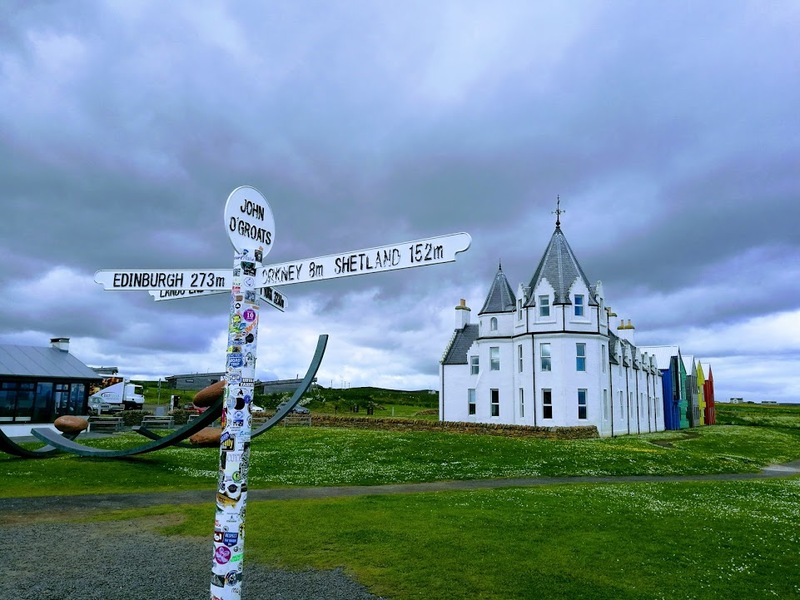 Friday took us from Thurso to Muir of Ord via John O’Groats, Wick, Brora, Glenmorangie and Dingwall. The East coast is a very different beast to the West, but nevertheless provided some beautiful scenery and significantly faster roads. Now, our accommodation in Muir of Ord was interesting to say the least! As kids, the idea of spending the night in a shed was exciting – the thrill of the outdoors, the sounds, the animals all added up to genuine boy scout fascination. However, as grown ups it’s a different proposition altogether. We booked the ‘chalet’ on Air BnB thinking how cute and original it might be. 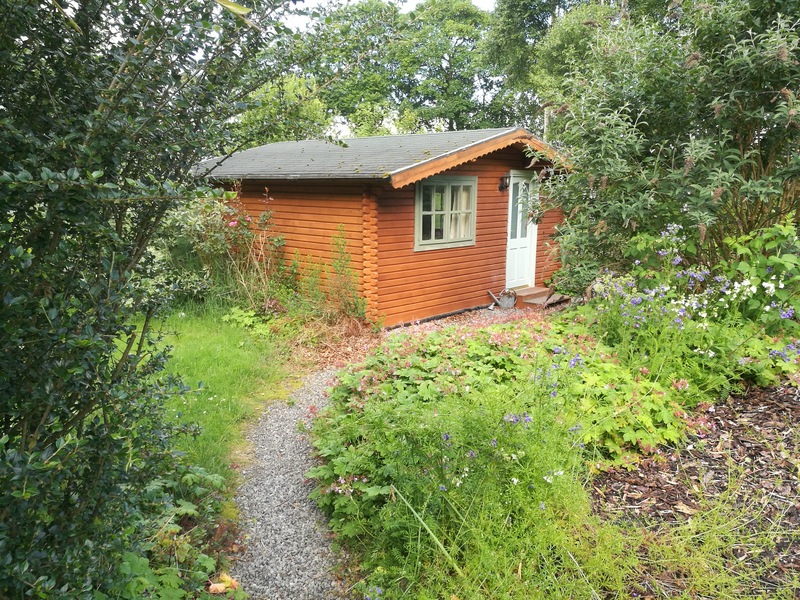 We left the following morning vowing to never again choose to spend a night in a garden shed. Not to worry though. 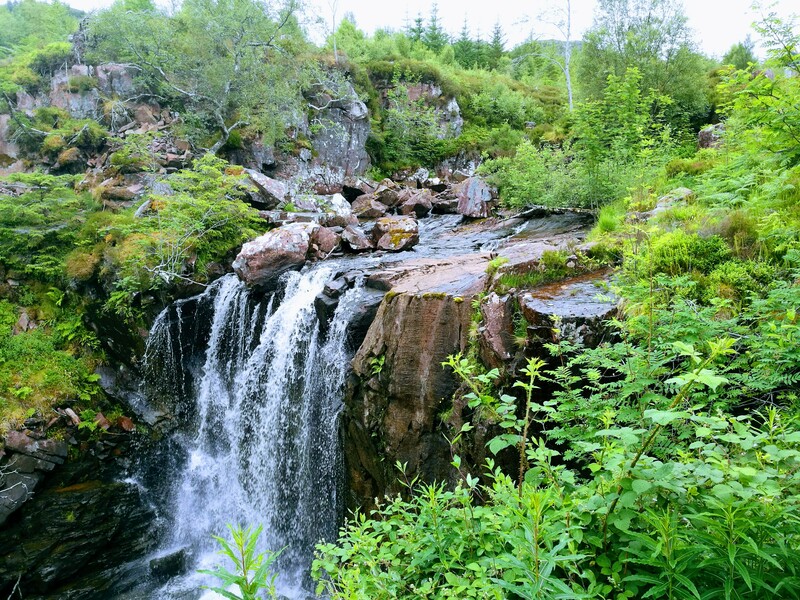 We just put it down to experience and started our homeward journey down along Loch Ness through Fort William, Glencoe, Loch Lomond, Glasgow and eventually ended up in the delightful Springkell, near Lockerbie. 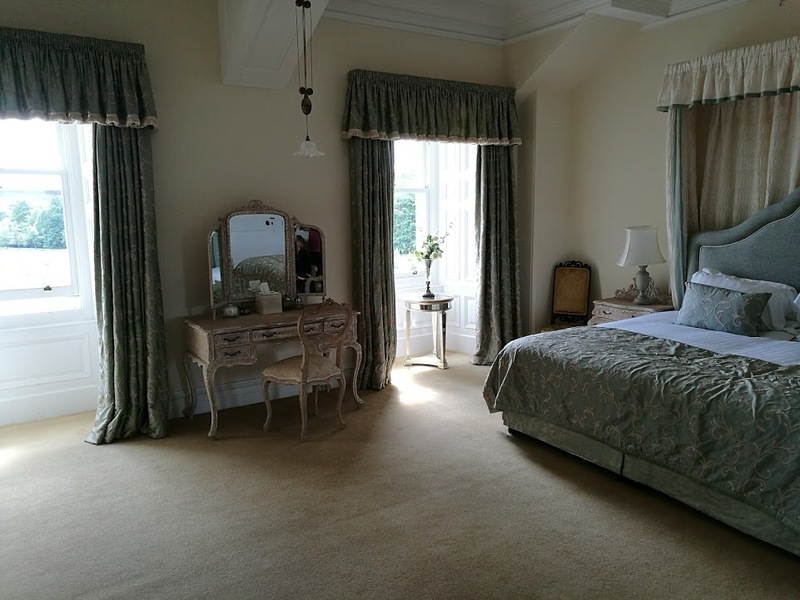 Waking up in a Palladian Mansion seemed like the perfect end to our North Coast 500 trip and sleeping in our own bed that night was the cherry on the icing on the cake! 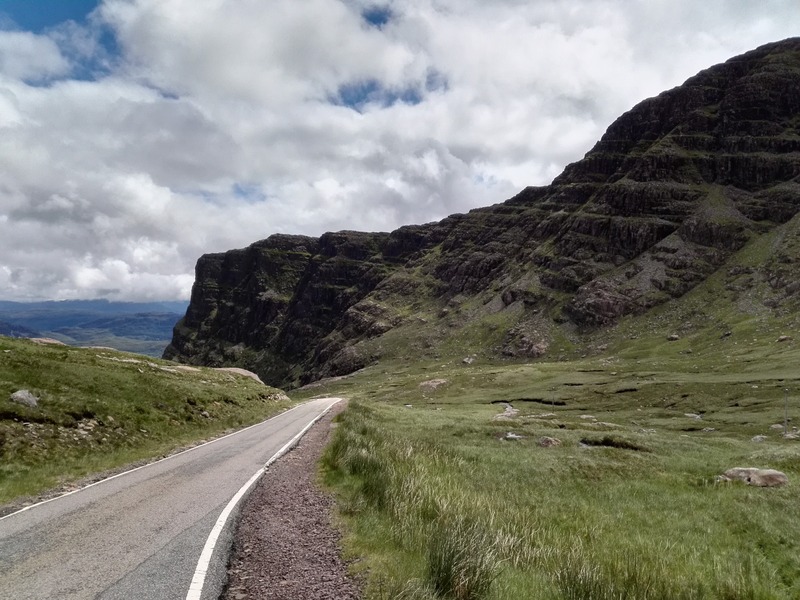 If you ever get the chance to ‘do the North Coast 500’ then do it. You won’t be disappointed. believe me! Win an Ultimate Adventures Smartbox Worth £159.99!